Click for larger version (PNG):page 1, page 2; click for PDF version: page 1, page 2. Click here for the list of dolls. I drew this for my mom for Christmas, and she gave me permission to post it. I hope you all like it as much as she did! 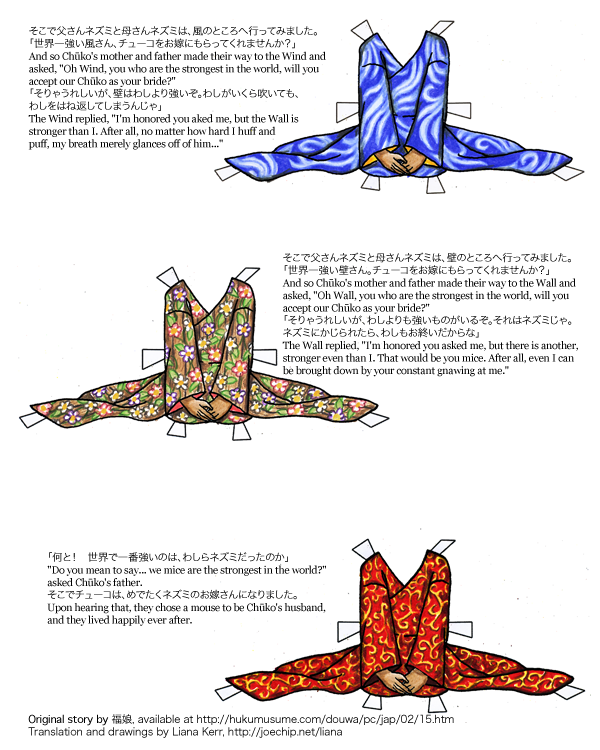 I’m still learning the ins and outs of kimono drawing, so please forgive any inaccuracies. 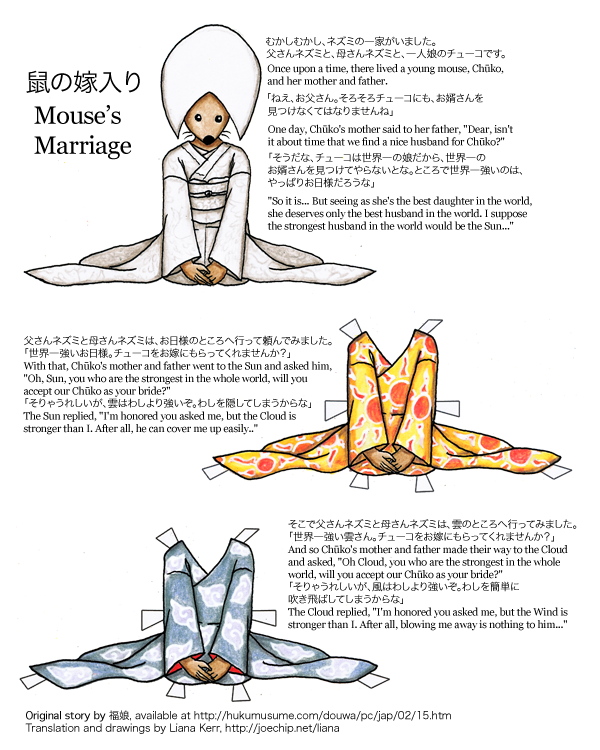 The original Japanese story can be read here: ネズミの嫁入り (Mouse’s Marriage). I’ve been in contact with the maintainer of that site, actually, and she’s given me permission to translate the other stories there, so I plan to do a lot of those in 2011. Speaking of 2011… Sometimes, people will e-mail me and ask how to draw dolls, and the advice I give is essentially just to keep practicing, using resources like SenshiStock and library books on figure drawing. That makes me feel like a fraud, because I myself am lousy at drawing humans, and it really shows in my dolls. (I’m happy with Ivy for now, but drawing her took days.) I look at the work of some of my internet buddies like Lys, who does this great daily fashion journal and Boots, who draws dolls in really natural, comfortable poses, and I think, wow, if I could draw dynamic poses like that, or if I could draw great faces like that, or if my hands had that much expression… But then, to borrow a phrase from Jane Austen, I have always supposed it to be my own fault—because I will not take the trouble of practicing. I don’t have a great track record with New Year’s resolutions, and I believe last year I had none at all (which, really, I rather enjoyed). But I’m going to try one this year. I resolve to spend 20 minutes each day – or, perhaps, each day I can, let us not raise the bar too high now – sketching people. I know this is one I can do, because actually I have already been doing it off and on for a few weeks now. Two questions for you all. First, would you like me to post the results of my progress? It might help keep me on the straight and narrow to just scan my sketches and link to them at the end of posts, but I can’t imagine it would be very interesting. (Plus, the idea is slightly frightening – I do these sketches of hands that look more like dead sea anemones, and my pride tells me “better hide those, Liana.”) Second, since I’ll just be using freely available reference and stock images and possibly a book or two from the library, would anyone like to adopt my resolution and join me? I was thinking, if there’s interest from a couple other people, we might set up some sort of blog or forum, pick out the day’s pose, share our sketches and keep each other motivated. It’s just a thought, but if you’re interested, whatever your skill level is, e-mail me or post a comment. My next post will be on the 4th. Happy New Year! It seemed to Aithne like she was the only one of the three who bothered keeping up appearances anymore, the only one with any sense of propriety. The things her sisters wore these days! You couldn’t even blame it on a generation gap, as they were all equally old — no — they had positively lost their pride. It had come to a head two years ago when Medea came to visit, breezing through her door with a tan and a take-out box full of hen’s teeth. First off, she had insisted on being called Madison. (Madison!) Second, she displayed her new cardigan (did she say it was from the End of the Land? Horrid place, she was sure) with wicked, rebellious delight, stretching out an arm as though she expected Aithne to pet it. Finally, she had laughed at her sister’s new robes, remarking that it looked like she had her grocery list written on her hem and that she was totally stuck in the 1800s. Aithne replied that she very well might be, but it was much better than being stuck as a newt, the truth of which she proceeded to demonstrate. Mehitabel had had to step in (and stepping was something she quite liked since she had discovered thousand-dollar high heels — imagine that, going to your kitchen, instead of having your tea come to you, just for effect) to de-newt Medea, since Aithne refused to do so without an apology, and Medea’s communication skills had been reduced to skittering around and switching her tail. Aithne had had no contact with Mehitabel or Medea since, after yelling at the both of them that the family art was going to hell in a handbasket, a handbasket filled with pastel cardigans and Italian stilettos. They had left in high dudgeon, but she had been proved right by the grave injuries Medea had sustained attempting a ritual wearing her capris and cardigan one day; one does not, apparently, serve a traditionalist entity in modern styles. For any of you who follow my paperdollverse, I believe that this set of robes is from a new collection from my wizard-world fashion designer responsible for this set of sunset-colored dress robes and this cool-colored set. Aithne is a witch, but she isn’t technically a part of that universe, so she had to go rather a ways out of her way for it and ended up paying quite dearly for it; she believes Medea got off lightly for insulting it.